Love the chevron shorts, Khatu! They look great on you! Gorgeous as always, Khatu :) I love the colour blocking and necklace layering (you are such a pro at that!) and I think I like your shoes even more than the PLV ones! The ankle strap really adds something special. Hope you're having a great Monday lovely! 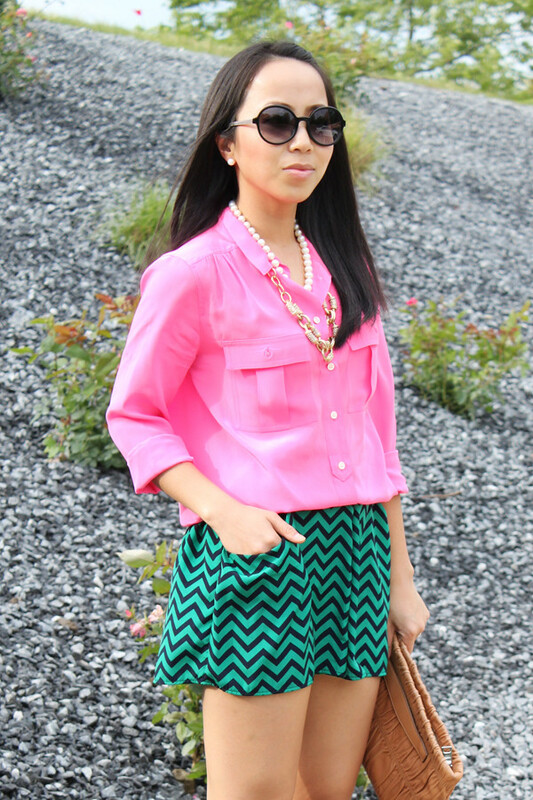 love the color blocking and chevron print! so cute! I am a huge fan of zig zags and chevrons right now!! Beautiful! Love the colors and print. Once again another fabulous outfit from you Khatu. Can get any cuter than this??? Woooow, I LOVE this outfit, pretty and catchy!! great style. Love the pink top. It looks so pretty with the skirt. i love those wedges. so cute with the pointy toe and the ankle straps. one of my favorite items! i think it's perfect that you found the most amazing background for this outfit shots. my favorite from this outfit post are the shoes. it looks chic & comfy! You look radiant and lovely! The color mixing is amazing! You look fab! I adore the shorts! Such a fun summer look!